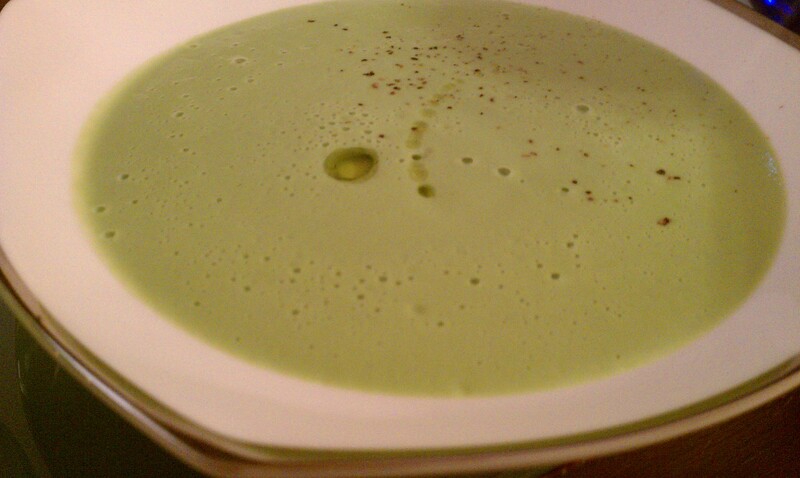 Serendipity struck in the kitchen last night: I made a delicious broccoli cheddar soup on the fly, and it was terrific! You’ll see from the picture on the left, that it’s bright green, not orangey-yellow. When you mix green broccoli with naturally white cheese, you get a beautiful bright green soup. Mainstream cheddar is orange only because industrial food companies dye it that way. I had a lightbulb moment about this last weekend when I visited some cheese artisans at the Texas Daily Harvest farm in east Texas. I must tell you, this was a revelation to me. My broccoli cheddar soup was serendipitous because I was making another dish, and ended up with mushy broccoli that I couldn’t use. I had meant to blanch my broccoli, and then put it in an ice bath, but I ended up letting it boil too long. This turned out to be a great thing, because it turned into a delicious, easy soup. I hope you like it. I blended it for five minutes on high in my Vitamix blender*, and it came out velvety smooth and piping hot. Drizzle good quality extra virgin olive oil (Tutta Toscana) over the top, and enjoy! You may also want to experiment by adding a dollop of creme fraiche or sour cream, and maybe some toasted pine nuts. Buon appetito! *If you don’t have a high-performance blender such as Vitamix or Blendtec, you’ll need to heat it on the stove. (Blend the broccoli with the liquid ingredients, pour it in the pot, add the shredded cheese, and heat.) I love the Vitamix; it makes hot soups, smoothies, and so much more; I use it almost every day. It has an air-cooled motor that allows it to run for long periods of time without overheating. Can’t wait to try it! And I am interested in learning more about dye-free cheddar… who knew??? Hey, Kelly, saw your video on Kimberly’s site. Good for you!! And this recipe sounds absolutely, delish. Will definitely be trying it out! Thanks for posting.